In chapter 3 a major point is prayer. When Ms. Watson and Widow Douglas try to talk about prayer to Huck, they try to explain selflessness and empathy, but he finds it pointless. Huck is then told about two different gods. A good and a bad. He wants to belong to the good God, but he is honest with himself and thinks that won’t happen. I find it really interesting that the author would choose to include a touchy topic, such as religion in his work. A lot of people can get easily offended by such a topic. However, Twain is a risky writer and makes sure to leave the chat about religion open ended. At one point soon after this part of the book, Huck hears a rumor that his dad is dead. At first he’s actually happy because his dad use to abuse him. I feel like this may be one of the hidden reasons for Huck’s misbehavior and sneakiness. 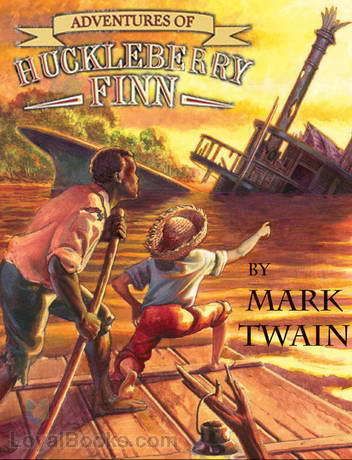 Huckleberry Finn dialectic Journal by Melaina is licensed under a Creative Commons Attribution-ShareAlike 4.0 International License. Melaina, I liked your analysis about this piece, looking at a moment where Mark Twain uses a touchy topic in his book. Great job for having a good eye to see this. I agree that Twain was a risky writer and included other subjects that provoked some controversy. Also, I think that another big example of his will to risk things is including slave life in the south, which caused his book to be banned during his time. I also agree that Huck’s “teachings” from his dad caused him to misbehave and have him have an internal struggle in the religion Miss Watson and Widow Douglas is trying to teach him. Nice work!